Welcome to Georgia Tech — we’re glad you’ve decided to join the graduate student family. Please follow the checklist below to help you make the transition to being a student. Activate your Georgia Tech account. Visit https://passport.gatech.edu to start the process. Complete your I-20 request (for international students). I-20s and DS-2019s for study on the Atlanta campus are issued by the Office of International Education after you have been officially admitted to Georgia Tech. You will receive emails from info@oie.gatech.edu asking you to complete information needed for the I-20/DS-2019. You will also upload a copy of your passport and any required financial documents in these electronic forms. (For financial document requirements, visit http://b.gatech.edu/UA0H4s.) After an I-20/DS-2019 is made, your academic department will send it to you directly. For more information, visit http://b.gatech.edu/1rNhm2T. Read over the Graduate Guide, which is a document that will fill you in on all of the policies and resources you need to know about as a new graduate student at Tech. You can find it at http://grad.gatech.edu/student-handbook. Learn about the RCR training requirement. Some master’s and all doctoral students will need to complete online and/or in-person Responsible Conduct of Research (RCR) training. Visit http://rcr.gatech.edu to learn more. Complete any GRA or GTA paperwork. If you were offered a graduate research assistantship (GRA) or graduate teaching assistantship (GTA) by your admitting department, you’ll need to complete any new hire paperwork and visit the Office of Human Resources or one of their distributed Graduate Student Employee Processing sites to complete the process. Schedule your Campus Visit and Tour. Learn about the graduate student visit and tour experience and schedule your next visit to Georgia Tech at http://www.gradadmiss.gatech.edu/visit-the-campus. Attend orientation(s). The Office of Graduate Studies hosts several orientation sessions for new students on the Atlanta campus that provide an overview of resources available to you at Georgia Tech. For more information, visit http://www.grad.gatech.edu/orientation-gradexpo to sign up for a session. Your program may also offer its own orientation that you should plan to attend. GTAs Attend TA Orientation. New GTAs are encouraged to attend TA Orientation in the Center for Teaching and Learning. Attend GradExpo. In August, the Office of Graduate Studies hosts the GradExpo event to help new graduate students learn about campus services, student organizations, and local businesses in the surrounding community. For more information, visit http://grad.gatech.edu/orientation-gradexpo. Participate in Grad Groups. Grad Groups is Georgia Tech’s extended orientation program for new graduate students on the Atlanta campus. Navigating the nuances of graduate school can be challenging, so don’t embark on this journey alone. Participants are organized into groups of about 15 students from a variety of degree programs, academic interests, and cultural backgrounds. Each group is led by a senior graduate student, which allows participants to tap into their group leader’s valuable experience and leverage that for their own success. http://grad.gatech.edu/grad-groups. Register for classes. New graduate students will be able to register for classes during the Phase II registration window according to the Registrar's academic calendar (http://registrar.gatech.edu/calendar). You will have an assigned registration “time ticket” indicating the specific date/time your access to the registration system will begin. You will be able to continue to register and make schedule changes through 4:00 p.m. on the Friday of the first week of the semester (when registration closes for all students). To access the online registration, go to the BuzzPort (https://buzzport.gatech.edu) student tab. (This tab will appear before the start of the semester for new students). If there is something called a “hold,” you will not be allowed to register until you have submitted the missing information. Types of holds include Graduate Studies or Lawful Presence (contact Graduate Studies for information), Health (contact Health Services for information), SEVIS (contact the Office of International Education for more information), and Departmental (contact your home department). Pay all fees and tuition. This needs to be done after you register for classes. You will receive information about the status of your account from the Office of the Bursar via your Georgia Tech email account. The payment deadlines are provided at http://www.bursar.gatech.edu/calendar.php. Get your BuzzCard. Your BuzzCard student ID is your campus passport, library card, facilities access key, and can even be loaded with money to use at restaurants/dining halls across campus. The BuzzCard office is located on the second floor of Barnes and Noble at the corner of Spring Street and Fifth Street in Technology Square. Purchase your parking permit. You’ll need a permit if you will need to park on campus. 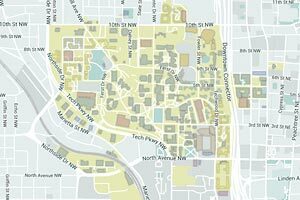 For more information, visit the Office of Parking and Transportation Services website at http://pts.gatech.edu. Review all of the resources. We've compiled a list of resources that are available to you ranging from information about child care to the Language Institute. Find the complete list online at http://www.grad.gatech.edu/resources. Review graduate sections of the catalog. This contains useful information about Georgia Tech, degree programs, and graduate policies and procedures. For more information, visit http://www.catalog.gatech.edu. Take the Admissions Survey. Help us improve our processes for future new graduate students. Take the survey here: http://b.gatech.edu/2kAlkgq.